HACKENSACK, NJ--(Marketwired - Sep 7, 2017) - A newly released study about the state of employee engagement in the US found that more than half (54%) of the employed adult workforce are disengaged at work and only a quarter are Actively Engaged. The study was conducted in 2016 by customer experience strategy and design firm Strativity Group, Inc. and provides new insight about the drivers behind positive and negative engagement at work. Companies with disengaged employees risk undermining consumer-focused activity, and may experience reduced consumer engagement as a result. 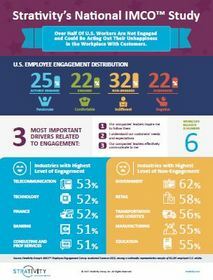 The study found that Finance and Technology sectors have the highest scores of employee engagement while Retail and Government have the most disengaged workforce. The employee survey of more than 30,000 working adults in the United States, is one of the largest of its kind. Strativity group classified results into four groups: Actively Engaged, Engaged, Non-Engaged and Disengaged. Disengaged employees, which make up 22 percent of the workforce, are putting in the minimum effort required at work and could be actively undermining any positive traction companies achieve with consumers. A further 32 percent of employees are "Non-Engaged" or indifferent at work, which passively undermines positive consumer engagement. These findings indicate that business leaders and managers must live leadership and company best practices in daily interactions. The least engaged employees tend to be those in "back office" jobs, who are not executives and not engaged with customers on a regular basis, yet still can have a profound impact on overall customer experience. Employees are starving for leaders that provide substantial direction communication and consistency with values and supervisors that inspire, support and develop them. "Engagement is not a 'millennials' problem. Disengagement at work is rampant across all age groups. By ignoring the needs of disengaged employees, executives directly undermine their values and their interactions with consumers," said Lior Arussy President Strativity Group. "Companies don't have a 'gen Y' problem, they have a 'gen why' problem. Today's managers and leaders can increase employee engagement by taking the time to explain why it matters, why they are asking employees to do a task. Helping employees understand how their work impacts customers will help them feel more engaged." "Companies today are searching for ways to put their consumer first, yet they have overlooked the fact that more than half of their employees are stalling those efforts," said Ed Murphy, Principal of Research and Metrics with Strativity Group. "Companies that address employee engagement through better leadership practices will reap the rewards of stronger employee engagement and better consumer engagement much more substantially than simply focusing on new technology or marketing tactics." Strativity, Director Mktg. & Comm. About this company Strativity Group, Inc.